El-Khirbe is located west of Ma‘ale Adummim on a rocky hill, 550 m above sea level. The hill is surrounded by steep slopes on three sides, but the moderate slope on the southern side affords easy access to the site. Agricultural areas extend to the west. The ancient Jerusalem–Jericho road runs to the north. The site was first surveyed by E. Dinur, who uncovered finds from the Iron Age and Persian (? ), Roman, and Byzantine periods. Flint tools of the Chalcolithic period and the Early Bronze Age were also recovered. 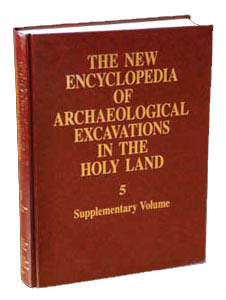 The site was excavated in 1995 under the direction of H. Hizmi, on behalf of the Staff Officer for Archaeology in Judea and Samaria. Four main elements were uncovered at the site: a fortress on the summit of the hill (area A), a cistern, dwelling caves, and a Byzantine inn (area B). THE IRON AGE. The fortress on the summit was roughly 0.5 a. in area. Its walls, 1.4 m wide, were constructed of two rows of stones, trimmed on their outer faces, and a stone fill. The corners of the walls were built of large stones and remain standing to a height of two to three courses. The eastern wall was only partly preserved; to the east of it, other fragmentary walls were found. The entrance to the enclosure was not uncovered but it is assumed to have been situated on the eastern side.